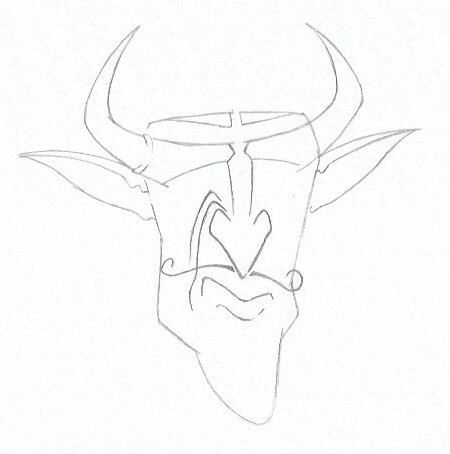 Today I am going to show you how to draw the devil. 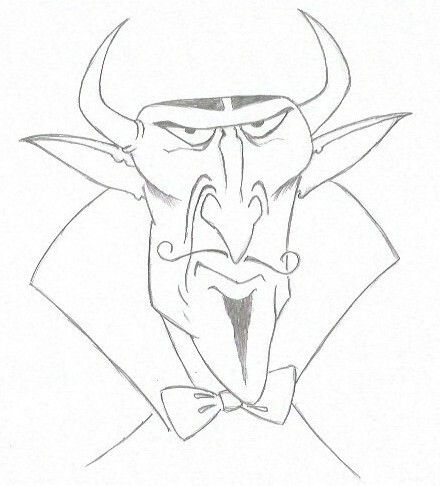 A well-groomed cartoon style devil, that is… I am using the book “How to draw 50 monsters” by Lee J. Ames, as my reference. It is one of the books in his “Draw 50” series, of which there are 26 different ones (I think!) all with different overall subjects. I don’t follow Ames’s instructions completely, there are a few places where I do things a bit differently. The steps as I’ve laid them out in this post are also a bit different than the original. This is just what makes sense to me. To give you a quick overview of the process, and perhaps a dash of inspiration, here is a super quick video of me drawing him. (For the actual follow along video tutorial, scroll to the end of the post). And here are the steps, for you to use as a reference, either alone or in combination with the video. 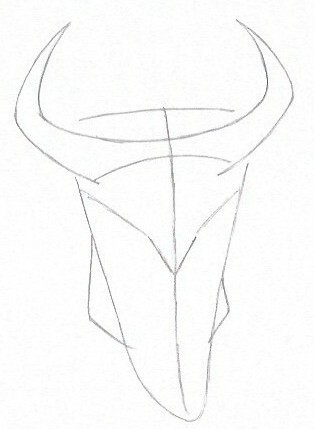 The basic shape of the head, the lower part of the horns and guidelines for the nose. 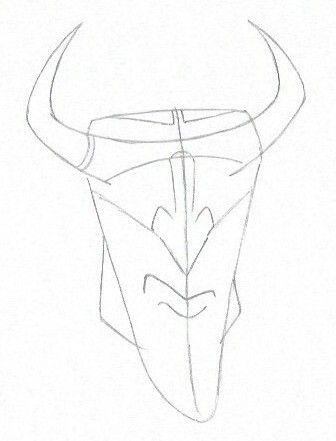 The top part of the horns, a guideline for where the eyes will be, and the basic shape of the jaw. 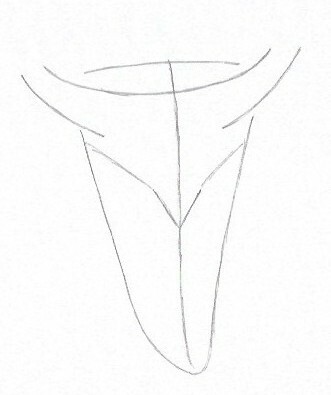 The basic shape of the hair, the nose, and the mouth. Adding the ears, wrinkles around the nose, and the mustache. Erasing some of the guidelines. Adding the eyes, another wrinkle of the nose, and the goatee. Adding the final touches of the face, erasing the guidelines. Enforcing lines as necessary, and adding the cape and the butterfly. And there he is! Mr. Lewis E. Furr, the devil himself in all his stylish glory! And just below you’ll find the full follow along video tutorial: I recommend using the video in combination with the reference drawings above, but it is of course completely up to you. For more awesome monster drawings, you can get the book “draw 50 monsters”, which is where I found this one. Keep drawing, keep practicing. And remember that drawing is a skill – let’s learn it! And as always, I’d love to hear from you, so if you have any comments please leave them in the section below, I’d love to hear from you! Plus it is always nice to meet a fellow artist! Thanks for visiting. Glad you liked the post. Yeah, ideas are always the key factor aren’t they?!? It seems to me that as soon as you have a good idea, the work just flows nicely. Wow, That is very cool! I draw this on my own with this video, that make Devil very easy to draw! But…. I still draw pretty bad (lol), maybe it still need some talent does it? Anyways, thank you for sharing this! Well… One of the basic premises of my site is that ANYBODY can learn to draw. Drawing is teachable and learnable skill, and not a magical talent, that a few lucky people have been blessed with. Perhaps you should start with something simpler. You could read this article for inspiration. Oh my gosh, I love love love this tutorial. Thank you so much for providing the video link because video is always a whole lot more helpful for someone like me! When broken down in steps like that, I feel like I can draw it too. I’m definitely gonna try this with my son 🙂 Thank you! Yes, I feel that video makes a big difference as well, when I go through tutorials myself. It just seems like seeing the process gives so much more than just having the steps on paper. Thanks for visiting and thanks for the comment. I love this. You have shown in detail and in just a few easy moves how to draw the devil. I am pretty sure I can do it as well now. My cousin loves to draw and I am going to share this page with him. 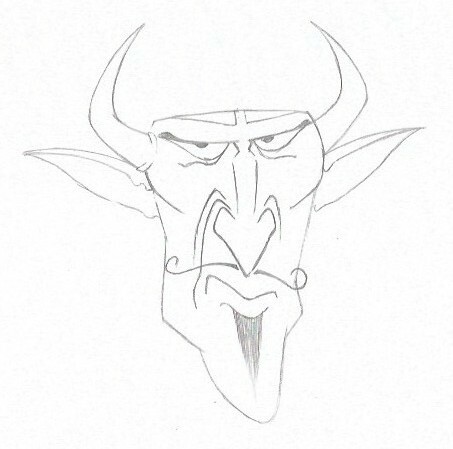 Thank you for the tutorial on how to draw a devil, it is amazing! Thank you for the kind words. I’m also pretty sure you can do it as well! I’d love to see the result. It’s amazing how just putting a simple few lines in the right places can produce a picture like that. My sister is a brilliant artist but unfortunately I don’t have the gift. I have a lot of other talents, but art is not one of them. My daughter loves to draw so I’ve bookmarked your site and will send her the link. You can always start off with something simpler. Take a look in the section of tutorials, I’m sure you’ll find something you can start of with.